What's exciting about technology is that it never fails to innovate. This year, the Consumer Electronics Show (CES 2014) staged several exciting advancement with our handhelds, one of which is the popular Gorilla Glass from Corning. The company has managed to turn up the level of its primary product. 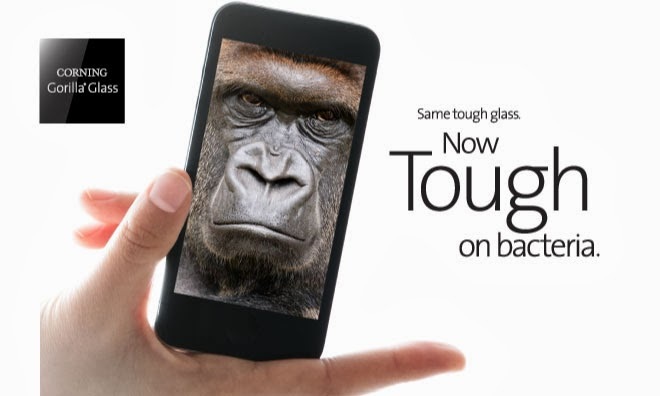 Gorilla Glass is the one responsible for protecting your phone from scratches...way better than the ordinary glass does. Now, the introduction of an Antimicrobial Gorilla Glass has raised several eyebrows of the glass-maker's competitors. A standard Gorilla Glass is composed of sodium ions. The glass is treated (or soaked) in solution of melted potassium salts. The main process occurs with ion exchange. These bigger potassium salts replace the smaller sodium salts to make a layer of compressive stress in the surface of the glass. The treatment of silver ions in the mixture makes the Gorilla Glass tough not just on scratches but also on microbes or bacteria. These ions are particularly in nano-silver form which has been used in antibacterial keyboards and households before. Corning has made it clear though that the new product will only "lessen" bacterial accumulation on the layer of your phone's plate. The next time you'll be in the market for new gadget, would you consider a "tougher" screen? There’s a comment section below, give us your thoughts.